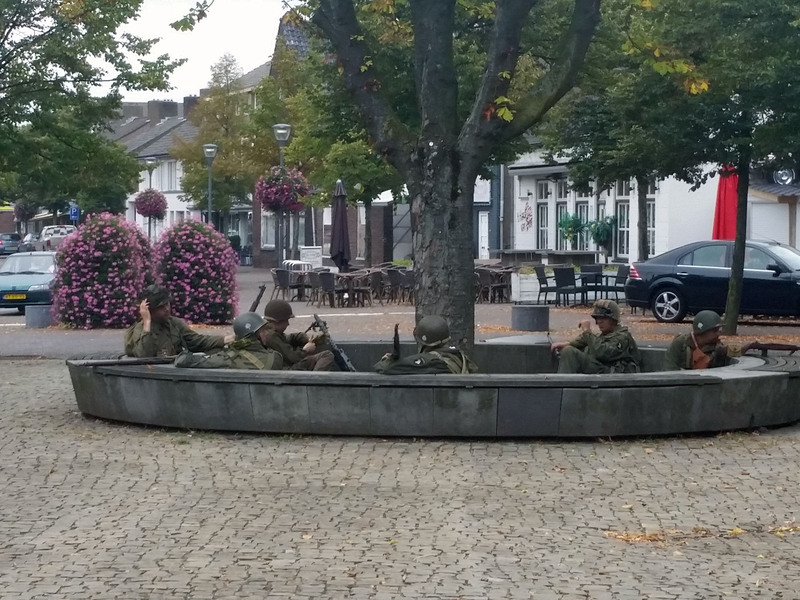 Two weeks ago I attended an Operation Market Garden re-enactment event in Son, Netherlands. 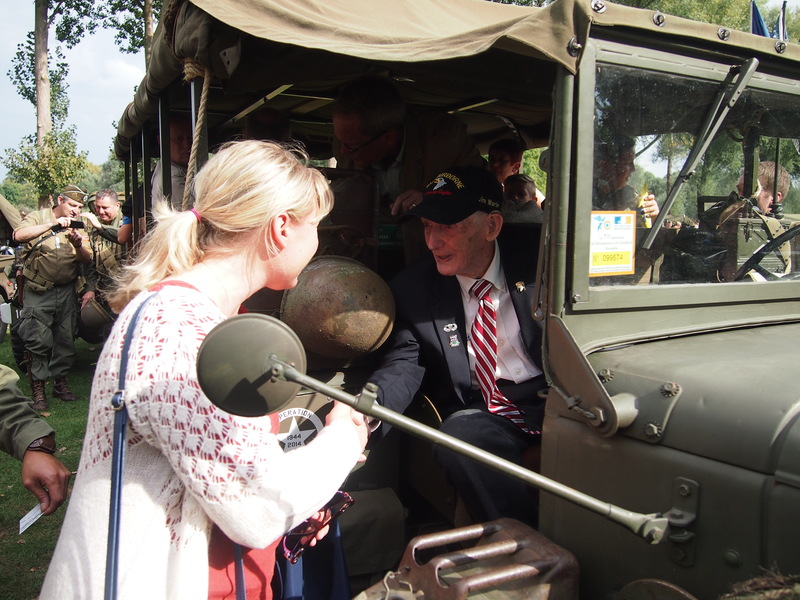 You can read about it in my article Honoring Service: Living History in the Netherlands. In this article I stressed the importance of living history and how it provides context for our World War II soldier research. Today I’d like to continue that thought with things Americans should know about European WWII re-enactors and living history events. 1. Re-enacting groups exist all over Europe and the UK. Many groups come from the UK, France, Belgium, Netherlands, Luxembourg, and sometimes Germany and Russia. They are not limited to the Netherlands where I have been spending time and writing about their events. Most re-enactors speak English. This is question many are asked when Americans first arrive at events. I spent time last November with the 104th Division Friends of the Timberwolves group. They dedicated an entire day to showing me their museum, taking me for a ride in a WWII jeep around the countryside in the Netherlands where the 104th liberated villages, and provided me with a lot of printed history to take home to read. 2. The re-enactors own all the vehicles, uniforms, weapons, ammunition, books, and other items you see at an event or encampment. Often, re-enactors are asked how the vehicles, uniforms, weapons, and other items visitors of battles or encampments see, get to Europe from the U.S. for the event. What visitors do not realize is, the things they see were left here (for the most part) after World War II. Some items are battlefield pick-ups and others were found in various locations around the continent. On occasion, items are purchased from U.S. sellers and shipped to Europe. 3. They invest their time and money. Re-enactors are volunteers. It is rare to be paid to participate in an event. Usually, events in which they participate require a fee to participate. This comes out of the re-enactor’s individual pockets or their group budget. 4. Re-enactors do extensive research into the unit(s) they re-enact. Many provide educational programs in local schools. Some provide tours in the areas in which they live or have special knowledge of units and battles. 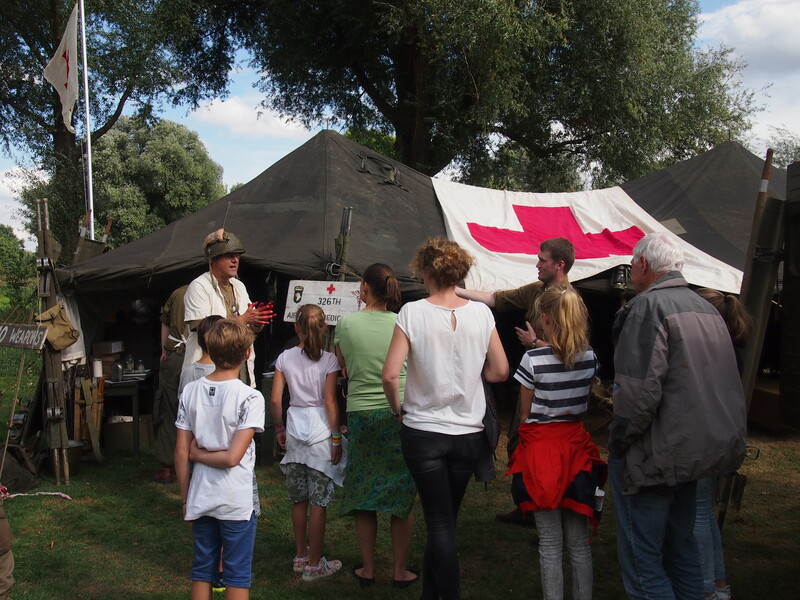 Part of the educational experience provided at events is the history of the unit, area, battle, or equipment used. School groups often attend events with an activity to complete so they talk to the participants and learn about the war. Re-enactors often visit schools to provide information on specific battles or commemorative dates. 5. Re-enactors try to explain what Americans did in Europe during the war. This includes clarifying misconceptions about battles, locations of troops, what was written in history books or is taught in school today, and issues that arose during the war. Not all books written about the war have accurate information. We have to keep in mind that military reports are written from many different perspectives. The battles fought are usually described in different ways by participants. Picture two men sitting in a foxhole, both looking in different directions. They will experience and describe a battle from two different perspectives. Same battle but different experience because of the way they were facing and the trials they endured. Re-enactors do research to help clear up some of the discrepancies in written histories and provide information on what actually happened in their countries. 6. Many adopt American graves at one of the European ABMC cemeteries for WWI or WWII. Many re-enactors adopt a grave at one of the American Battle Monuments Commission (ABMC) Cemeteries in Europe. This means they honor the soldier’s grave or his name on the Wall of the Missing, several times a year. This often happens on the soldier’s birth date, death date, Memorial Day, Veterans Day and country Liberation holidays. Grave adopters research the service of their soldier so they can tell their story. One of the most important pieces of the research is a photograph so the adopter can put a face with the name. 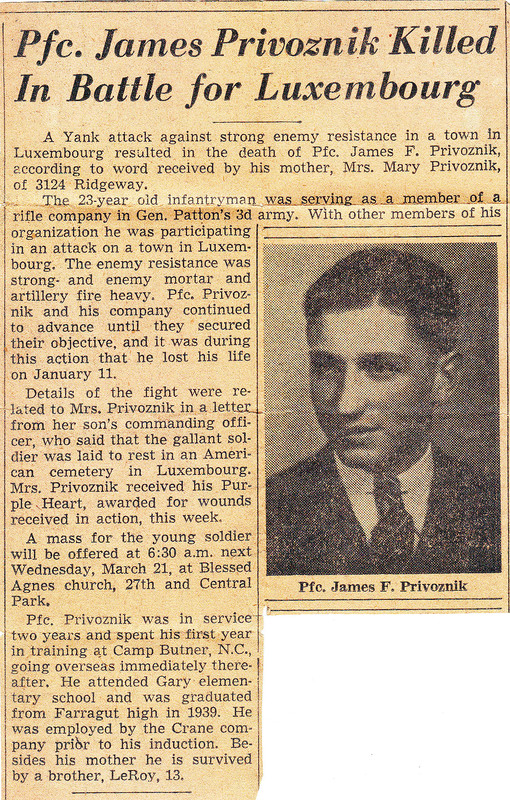 Usually grave adopters try to locate family members of the soldier. When this happens, both parties are able to share information and put more pieces of the soldier’s story together in the puzzle. Important! ABMC runs the cemeteries, maintains the cemetery grounds and graves, visitor center and chapel. Grave adopters have no responsibility for the upkeep of any grave they adopt. Their only “job” is to honor the memory of the soldier. It is commonly misunderstood that grave adopters maintain the graves they adopt. 7. Re-enactors often join U.S. WWII reunion associations. They travel to the U.S. to attend reunions and special events, write articles for those association newsletters or magazines, and interact and travel with with veterans in the U.S. and Europe. Our World War II veterans are dying by the hundreds each week. Many re-enactors have met veterans from units they re-enact, both at events in the U.S. and in Europe. They become friends and visit each other on both continents. Often the re-enactors will also write articles about events and resources in Europe for these association magazines or newsletters. This is another way they provide education. 8. 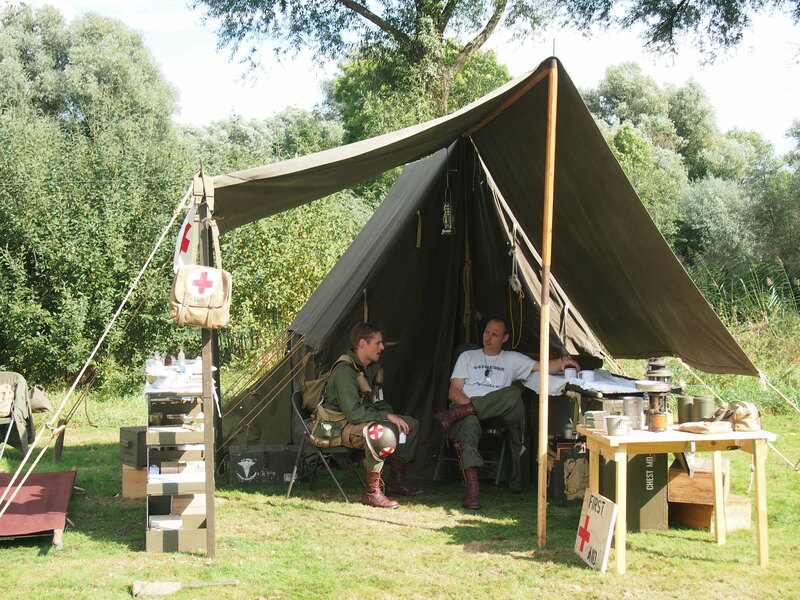 Re-enactment is not all about the battle but also daily life of a soldier. Many groups provide honor guards for commemorations or special events related to World War II in Europe. Battles are not always fought during re-enactment events. Many times, visitors can see and experience what daily life was like in an encampment. Men cleaning their weapons, setting up tents, preparing medical supplies, stocking vehicles for movement, typing reports, and eating meals. What our soldiers experienced in the war was not constant battle, although for some it may have felt like that due to little time off the front lines. Daily camp life was part of their experience that we should understand. It should also be noted, these events do not only happen during warm and nice weather. The war was a year-round event and those who fought in the Battle of the Bulge experienced one of the worst winters in Northern Europe’s history. Re-enactors can often be found staging battles or setting up camp even in winter conditions around the continent. 9. Due to the long history of warfare in the UK and Europe, re-enactors can provide re-enactment services for more than WWII. They can re-enact anything from the Middle Ages to the present. Europe has a longer history than the U.S. and of course, has participated in many more wars and conflicts. We know from history that country borders and alliances changed every time the wind blew. This long history provides individuals with many options to provide living history experiences. It gives them a chance to spend time with like-minded people on a hobby they enjoy. Re-enactors also wish to honor, educate, and remember the sacrifices of our men and women who liberated their countries. Have I missed anything you feel people should know about European re-enactment groups? Please leave your thoughts in the comments. Every trip I take to Europe provides multiple article and book ideas. It also provides a great deal of education for my work. I learn so many things I didn’t already know. The things there are to learn about World War II (only focusing on the American participation) are endless. Why do I leave with article and book ideas? Because I see so many incredible things, meet new people who do World War II research, and am engaged to a man who has a lot of really cool World War II books I do not have in my library. So many books…..so little time when I’m here to go through them all. He is also a 101st Airborne re-enactor, which adds a new dimension to the work I do and education I receive. Doing World War II research for their family and want to see if the items you have in the family are from World War II. Doing research for a town or a memorial. These books are especially important if you are putting together any type of exhibit for the public. 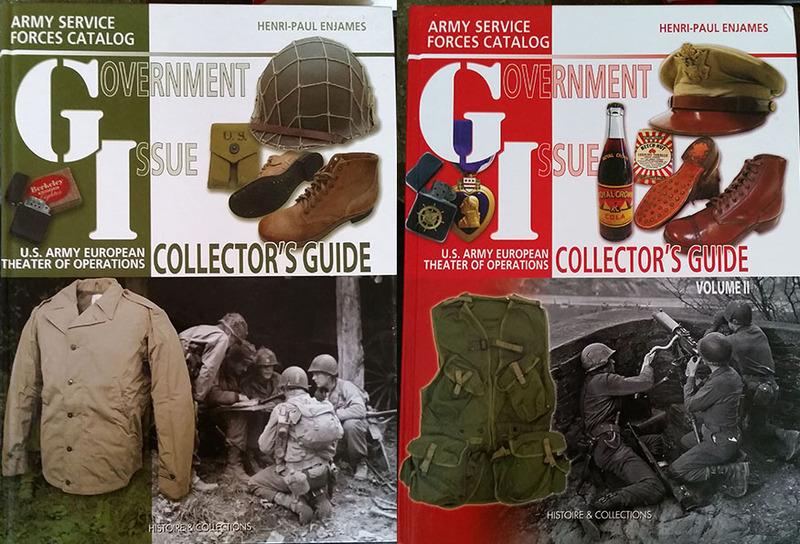 These books are by Henri-Paul Enjames, Army Service Forces Catalog Government Issue U.S. Army European Theater of Operations Collector’s Guide. There are two volumes because the author could not put them both into one book. Why do you need these books? The books are broken into many chapters which include Wartime Draft, Training Camps, Uniforms, Insignia and Decorations, Personnel Chapters (with uniform examples), POWs, Trophies and Souvenirs, Sports and Recreation, Chaplains, Female Personnel, and much more. There are large photographs, each captioned, with what the item is and sometimes when it was in use. 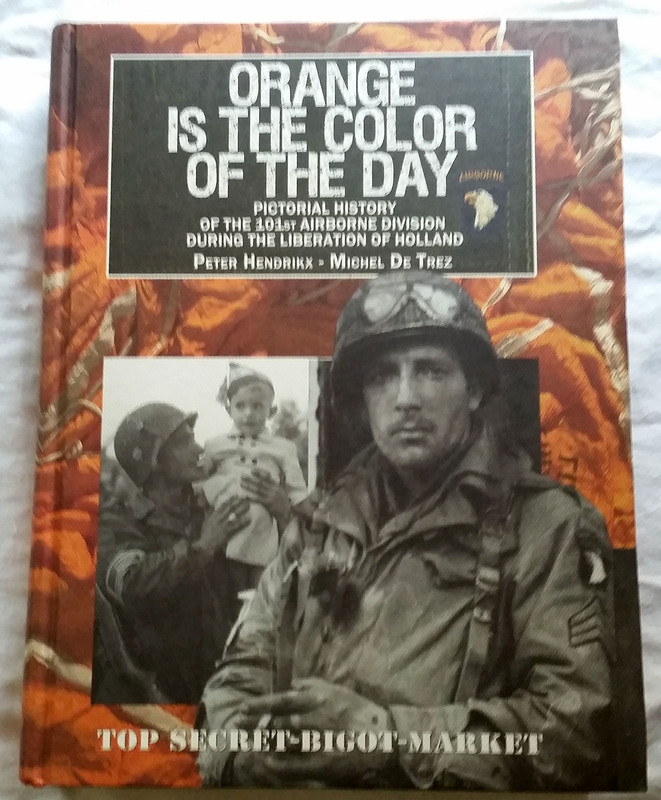 The photographs are in color so you can see what the soldiers were wearing, using, and what families received (VMail, cards, fountain pens and ink, etc.) How often do we see a color photograph of World War II and feel it is somehow “wrong” because we are so conditioned to seeing film footage and photos in black and white? There are uniforms, helmets, bags, boots, shoes, socks, underwear, and other items a soldier might have worn. You may have some of these items at home. There are examples of papers, books, wallets, fountain pen and ink, tags, and other paper related objects which soldiers may have used or been issued. You will learn what kinds of products they used for shaving, smoking, health care (teeth and body), and to keep their weapons and equipment in good working order. There are examples of equipment used, rations given, rifles and other guns and ammunition issued to soldiers. Finally, you can learn about your specific section of the Army – Chaplain, Engineers, Airborne, Infantry, Medical. There are chapters for those and more. These books have so much information, it is impossible to cover it all in one article. I encourage you to order your own copies or see if your local library has them to borrow. 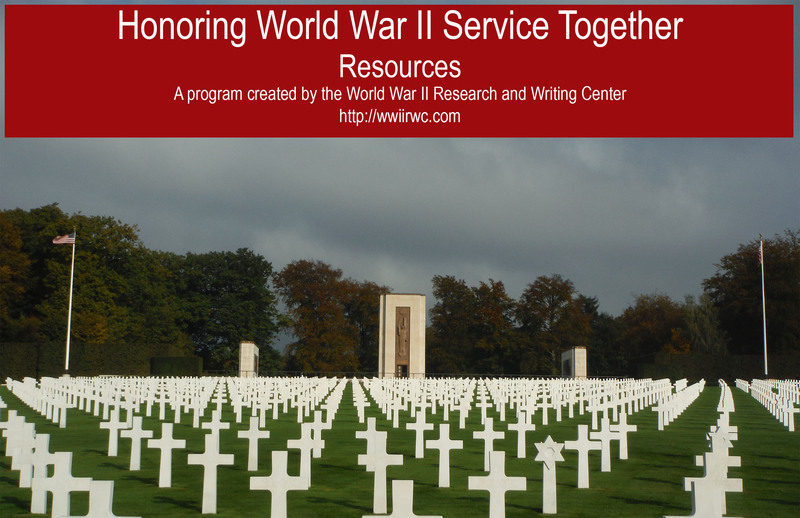 The items in these books will provide more context about the life your soldier lived during World War II, through what he wore, used in combat, ate, wrote with and on, and how he was trained. This is information you may not get out of Morning Reports, After Action Reports, or his OMPF. Those are our usual “go-to” sources for beginning research. Yet there is still so much more to learn. Do you know of other collector’s guides on the market? Any for the Marines, Navy, Coast Guard, or Merchant Marines? We’d love to know about other guides you have found useful.